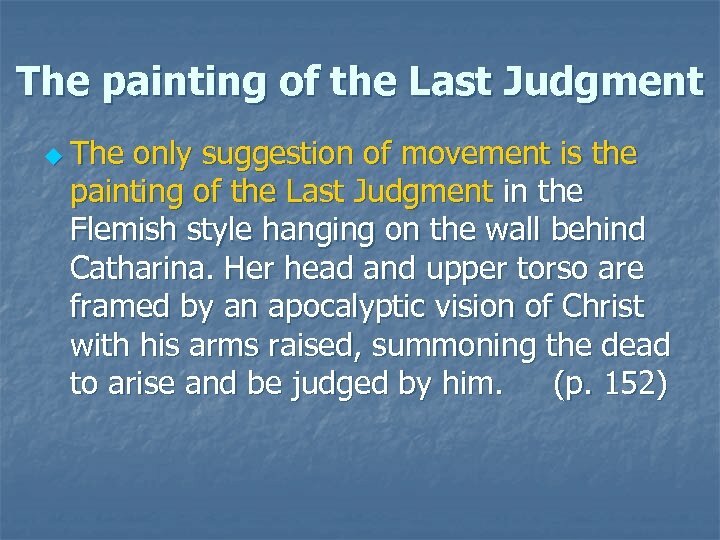 Let’s direct our attention instead to what the real woman in this painting is actually doing. She is holding a balance preparatory to weighing something. Is she weighing Pearls? Gold? 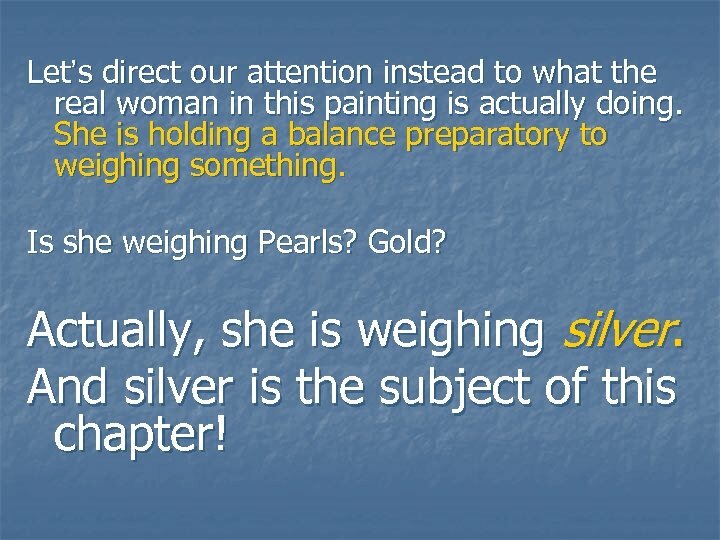 Actually, she is weighing silver. And silver is the subject of this chapter! u Weighing coins is not something we do today, but it was an essential part of economic transactions in the seventeenth century. 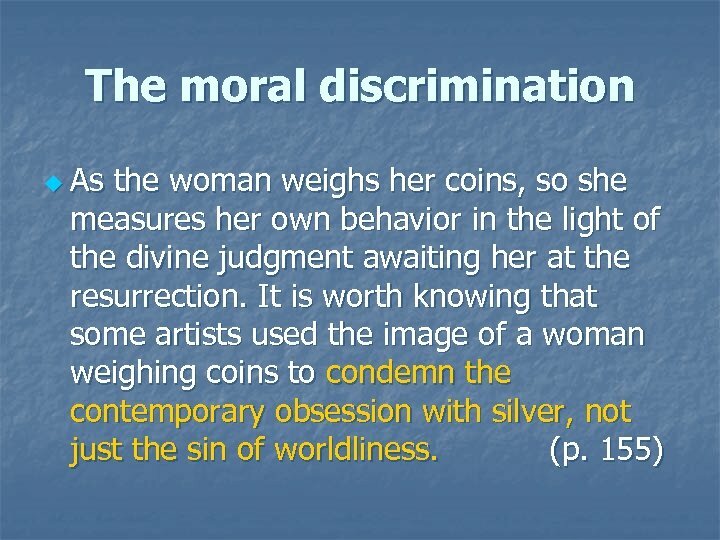 (p. 153) u The careful householder had to weigh her coins. 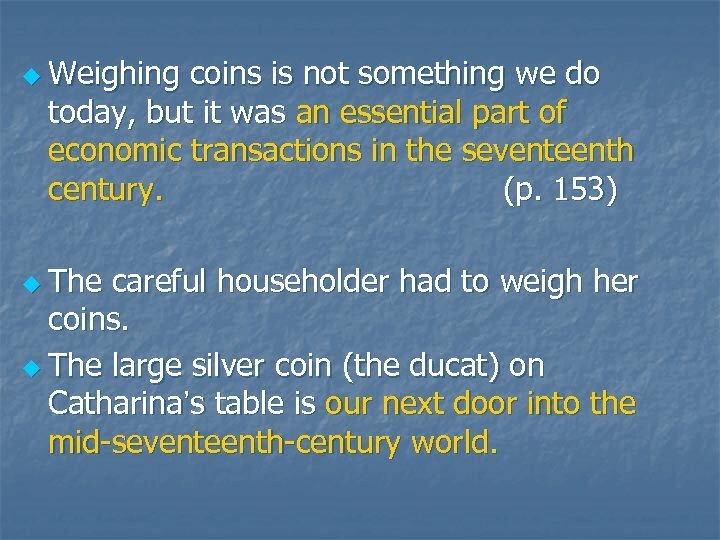 u The large silver coin (the ducat) on Catharina’s table is our next door into the mid-seventeenth-century world. 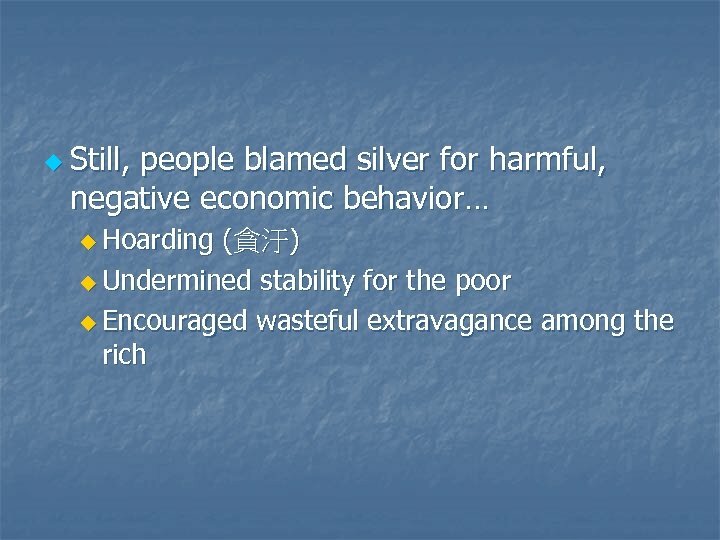 u To moralist from Europe to China, silver created the illusion of wealth but was not itself wealth. 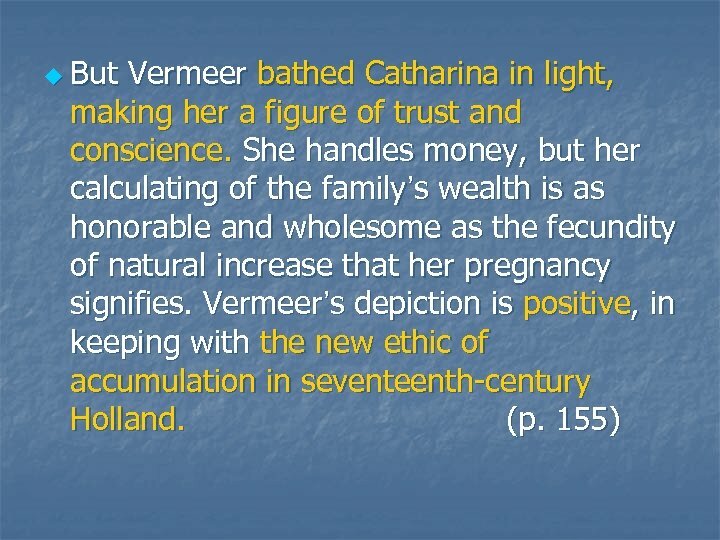 “merely the measure of wealth. 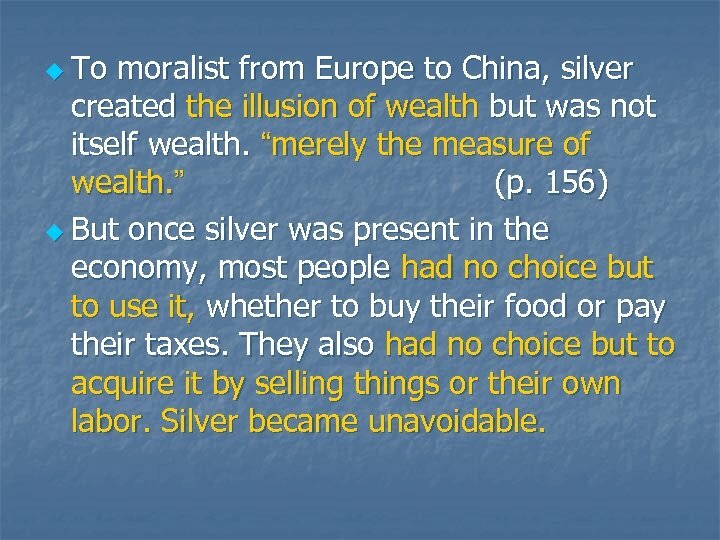 ” (p. 156) u But once silver was present in the economy, most people had no choice but to use it, whether to buy their food or pay their taxes. They also had no choice but to acquire it by selling things or their own labor. 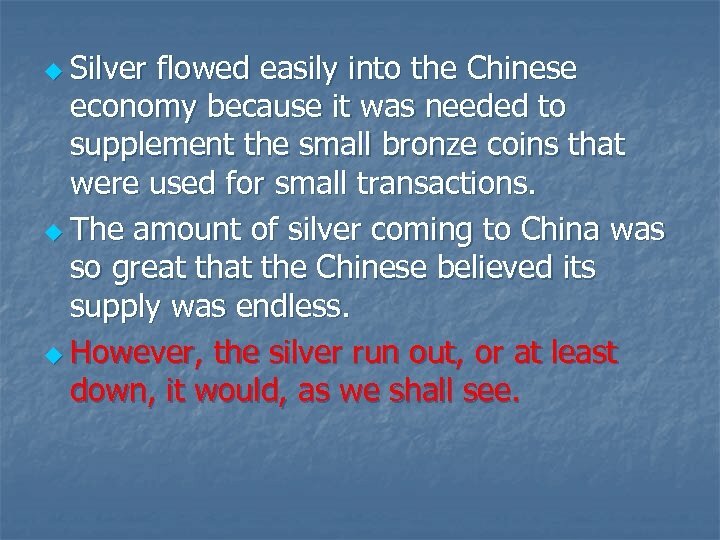 Silver became unavoidable. 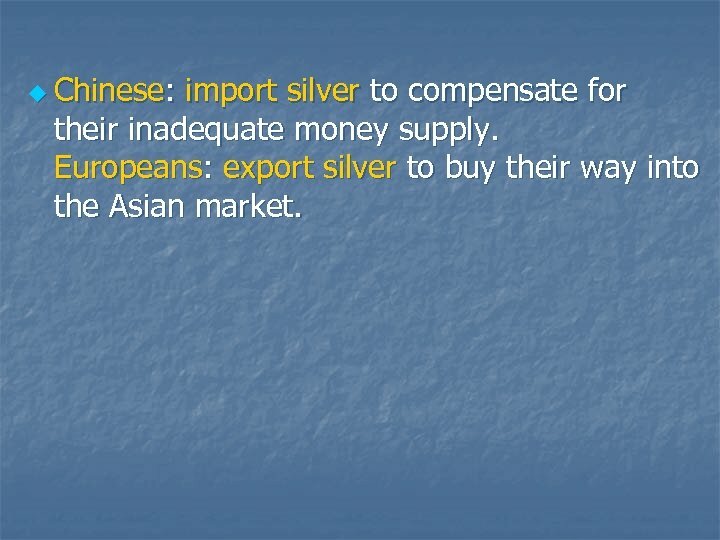 u Chinese: import silver to compensate for their inadequate money supply. 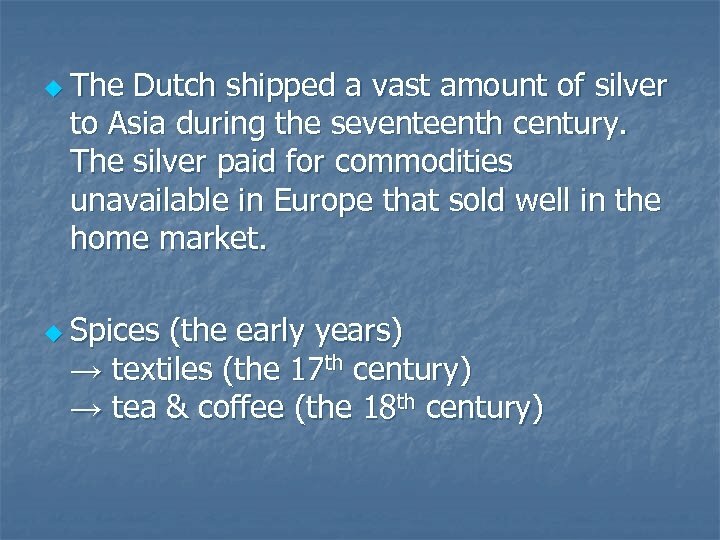 Europeans: export silver to buy their way into the Asian market. 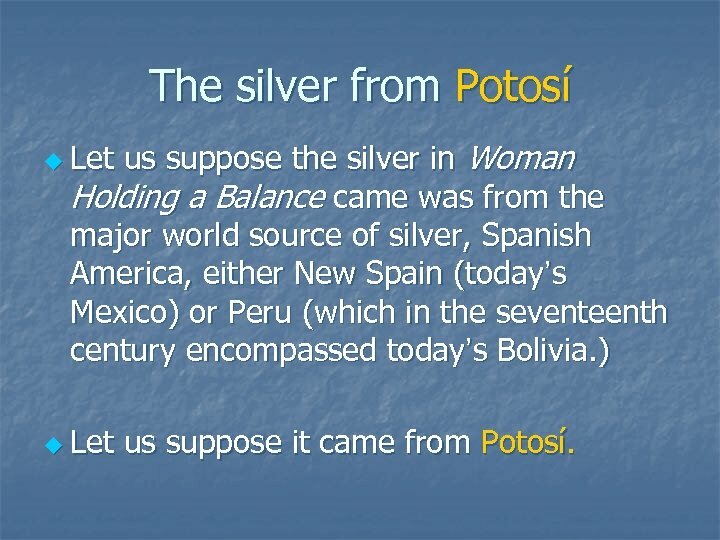 The silver from Potosí us suppose the silver in Woman Holding a Balance came was from the major world source of silver, Spanish America, either New Spain (today’s Mexico) or Peru (which in the seventeenth century encompassed today’s Bolivia. ) u Let us suppose it came from Potosí. u Potosí means “uninhabitable. 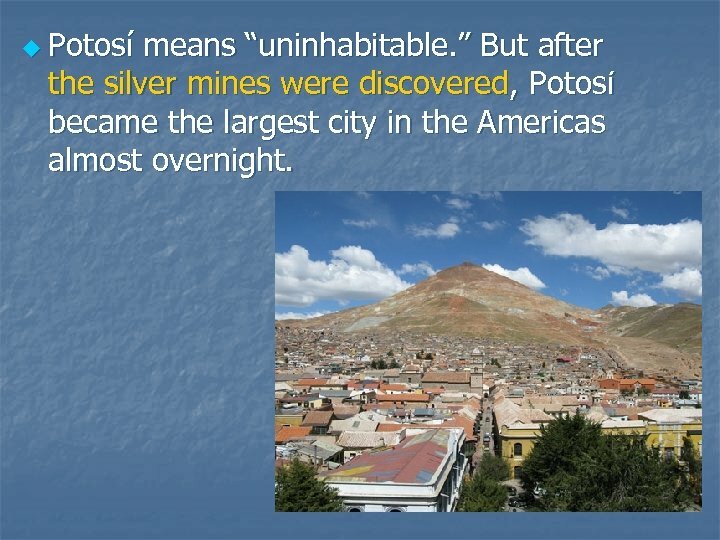 ” But after the silver mines were discovered, Potosí became the largest city in the Americas almost overnight. 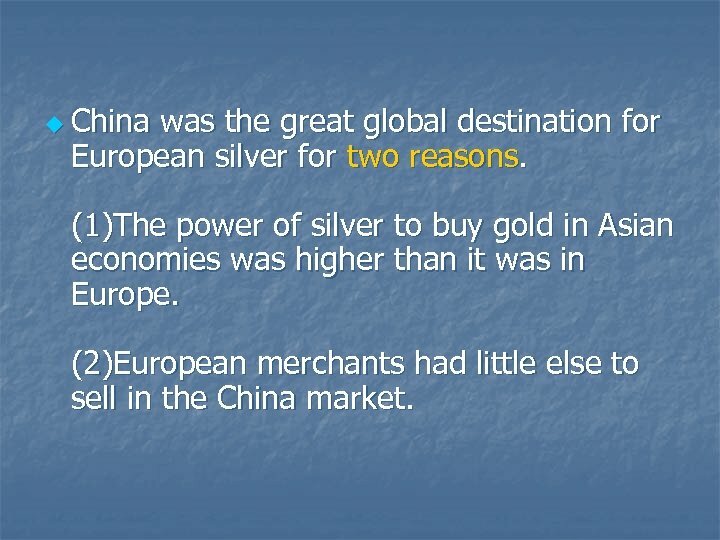 u China was the great global destination for European silver for two reasons. 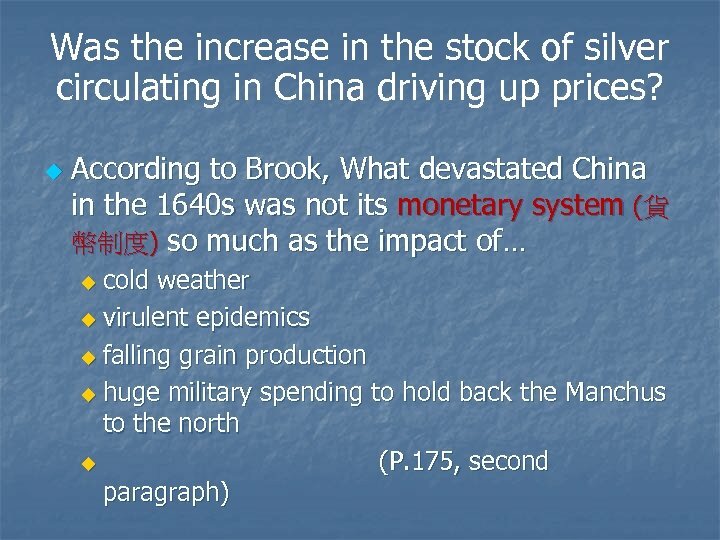 (1)The power of silver to buy gold in Asian economies was higher than it was in Europe. (2)European merchants had little else to sell in the China market. 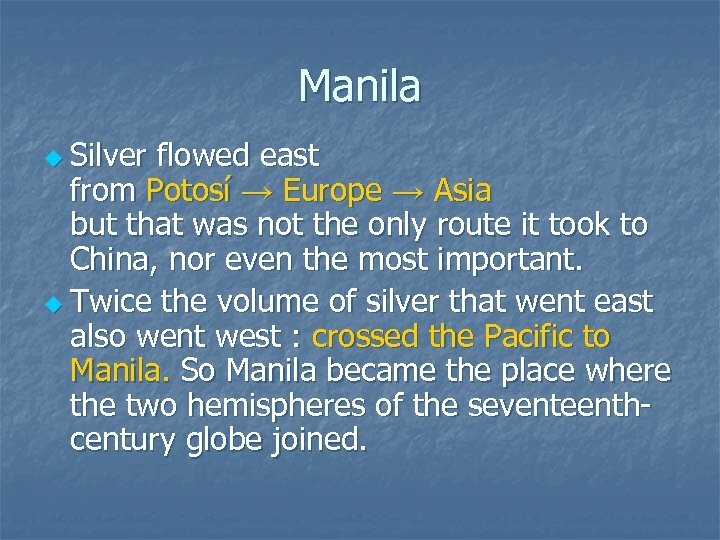 Manila u Silver flowed east from Potosí → Europe → Asia but that was not the only route it took to China, nor even the most important. 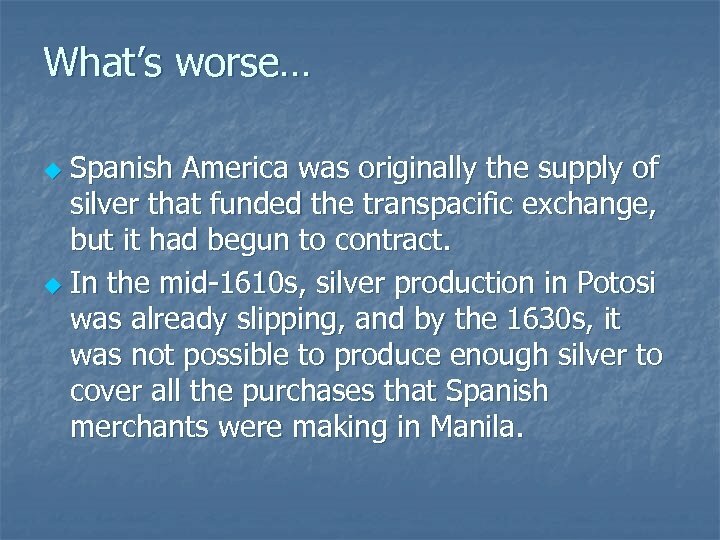 u Twice the volume of silver that went east also went west : crossed the Pacific to Manila. 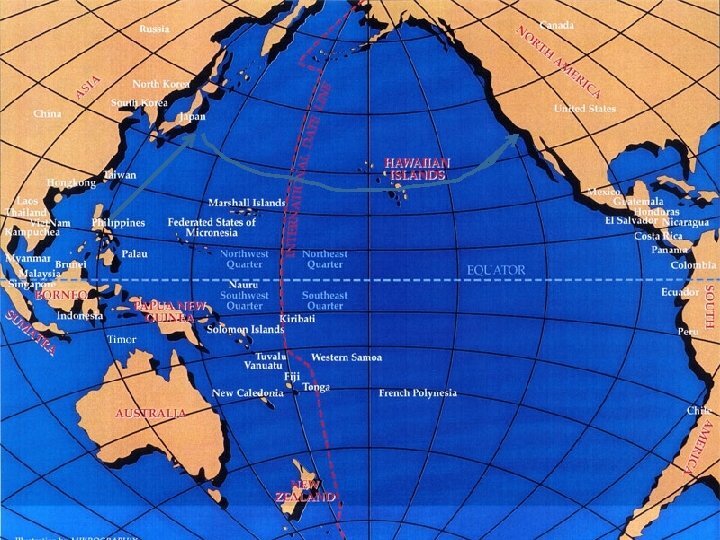 So Manila became the place where the two hemispheres of the seventeenthcentury globe joined. 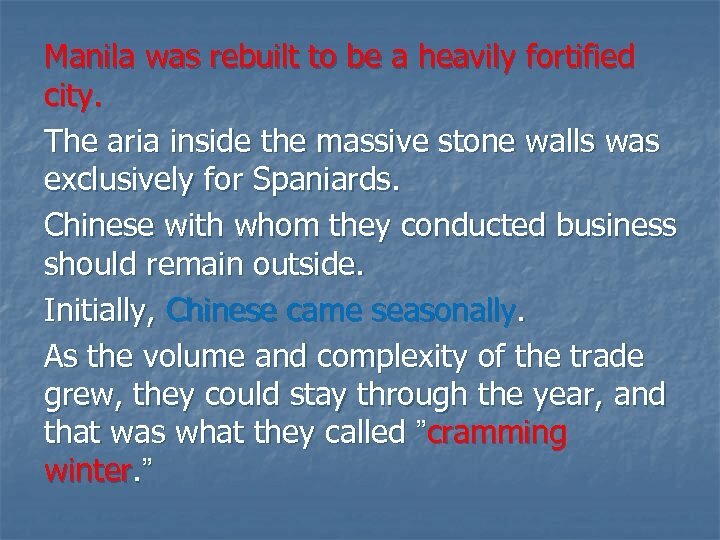 u When the first Spaniards in Manila found some three hundred Chinese merchants already there, their relations started well since each side sensed that the other might be a profitable trading partner. u In 1567, a new emperor lifted the ban on maritime commerce. It was a sign that the pressure of foreign demand was having its effect. 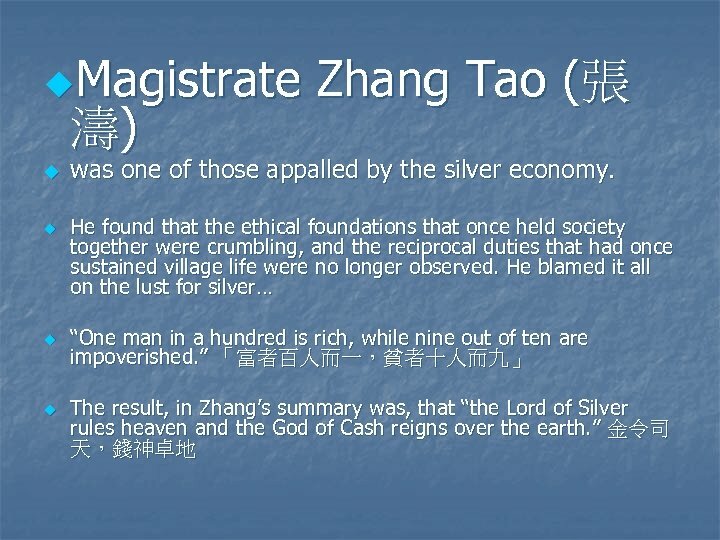 The bulk of the commodities went out of the harbor and the silver came in, tied China to the outside world. u u u Spain was an empire purely of trade, not of conquest. →The Spanish imagines their future in East Asia rather differently. 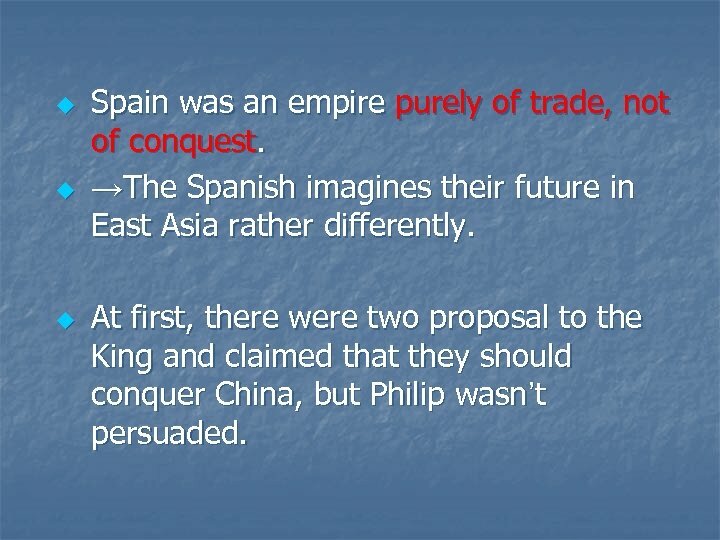 At first, there were two proposal to the King and claimed that they should conquer China, but Philip wasn’t persuaded. u. Governor of the Philippines gave his contemptuous view of Chinese, and thought that it was possible to conquer China. 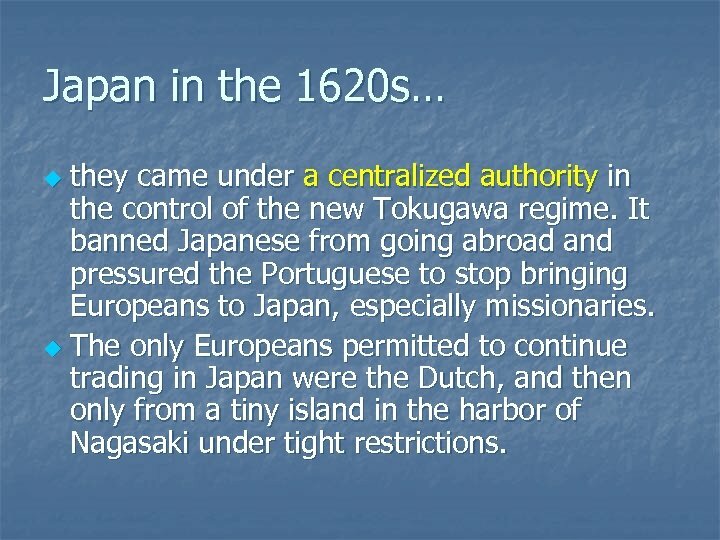 u→The another proposal was that they could send Jesuit missionaries to infiltrate the country. 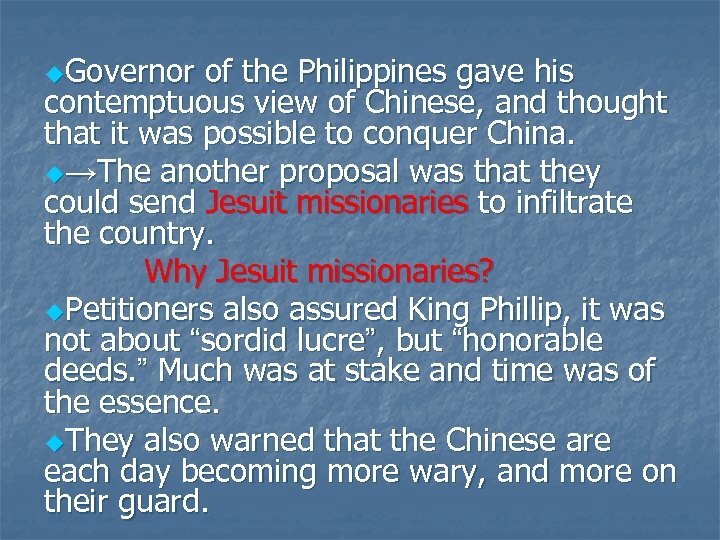 Why Jesuit missionaries? u. Petitioners also assured King Phillip, it was not about “sordid lucre”, but “honorable deeds. ” Much was at stake and time was of the essence. u. They also warned that the Chinese are each day becoming more wary, and more on their guard. u The oddest point that the argument made for invasion was ……. u China was in danger of falling into Muslim hands. 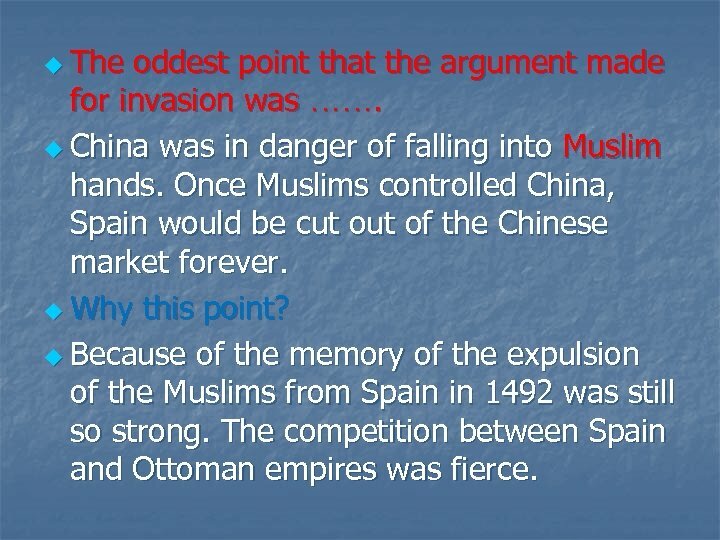 Once Muslims controlled China, Spain would be cut of the Chinese market forever. u Why this point? u Because of the memory of the expulsion of the Muslims from Spain in 1492 was still so strong. The competition between Spain and Ottoman empires was fierce. u. 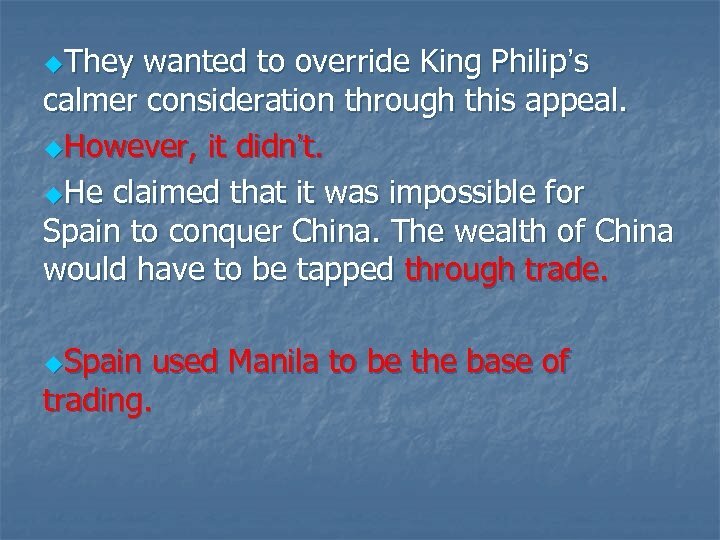 They wanted to override King Philip’s calmer consideration through this appeal. u. However, it didn’t. u. He claimed that it was impossible for Spain to conquer China. The wealth of China would have to be tapped through trade. 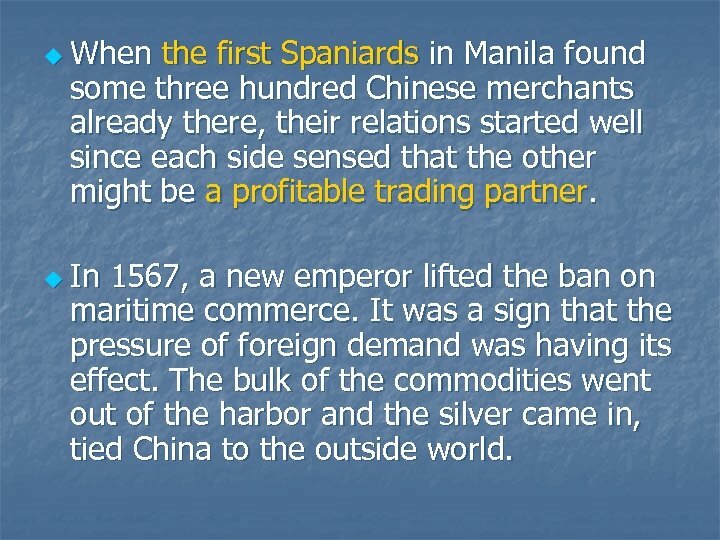 u. Spain used Manila to be the base of trading. u Alcaiceria, Parian, Pali? u →In 1581, Spain restricted Chinese to a “ Chinese ghetto”. They made the Chinese stay there at night. u Sangley? 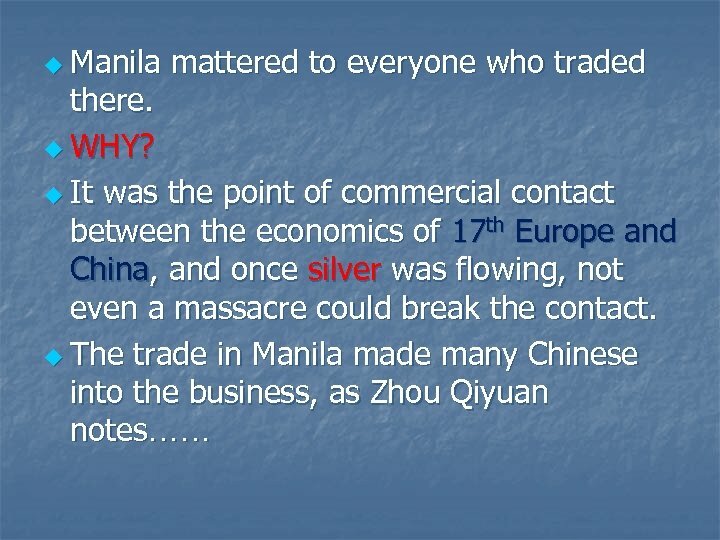 u →The Chinese who conducted trade in Manila. 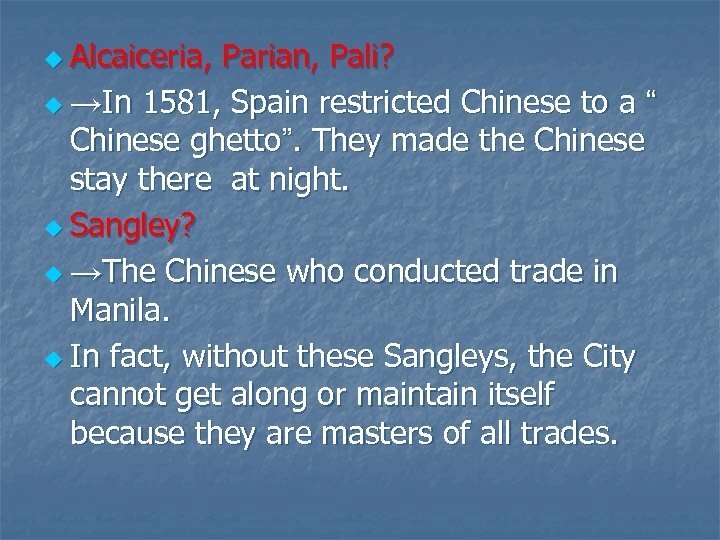 u In fact, without these Sangleys, the City cannot get along or maintain itself because they are masters of all trades. 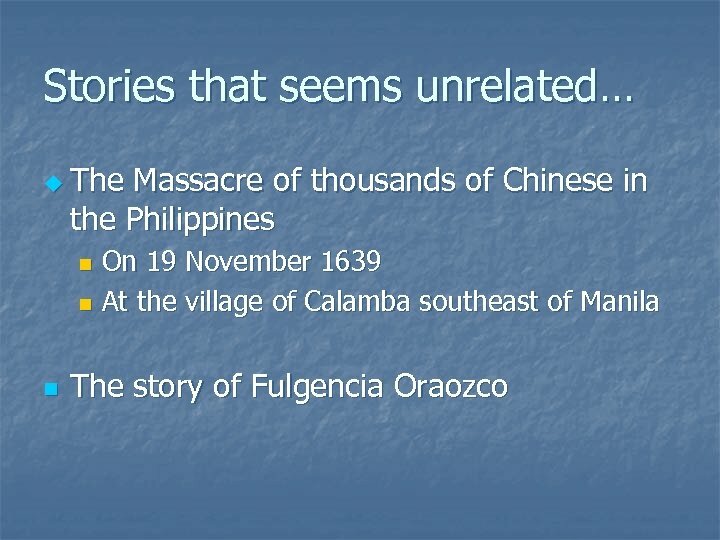 The massacre in 1603 Incidents that some Chinese visited Manila to prove the truth of Gold Mountain made Spaniards worried. 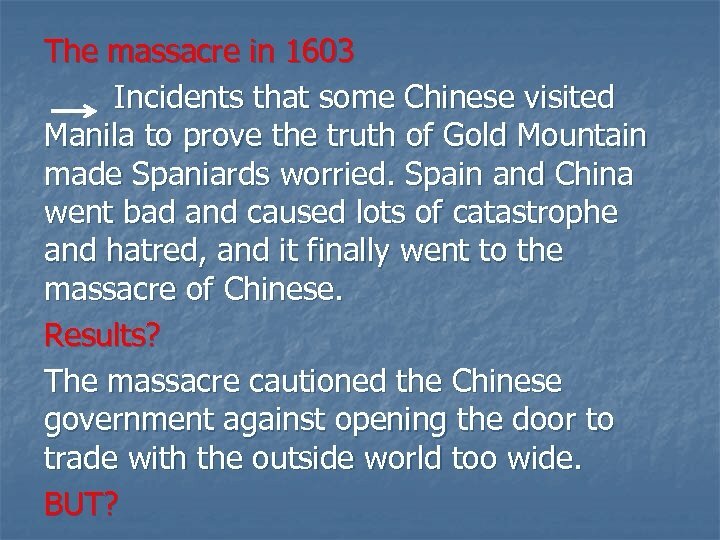 Spain and China went bad and caused lots of catastrophe and hatred, and it finally went to the massacre of Chinese. Results? The massacre cautioned the Chinese government against opening the door to trade with the outside world too wide. BUT? 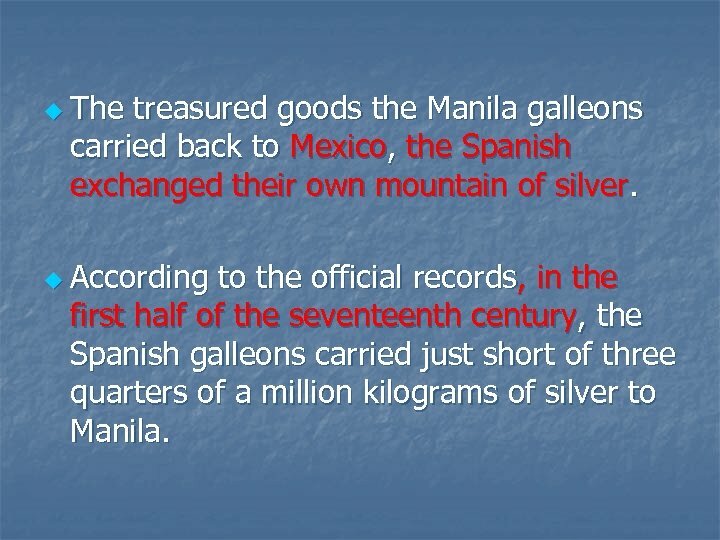 u The treasured goods the Manila galleons carried back to Mexico, the Spanish exchanged their own mountain of silver. 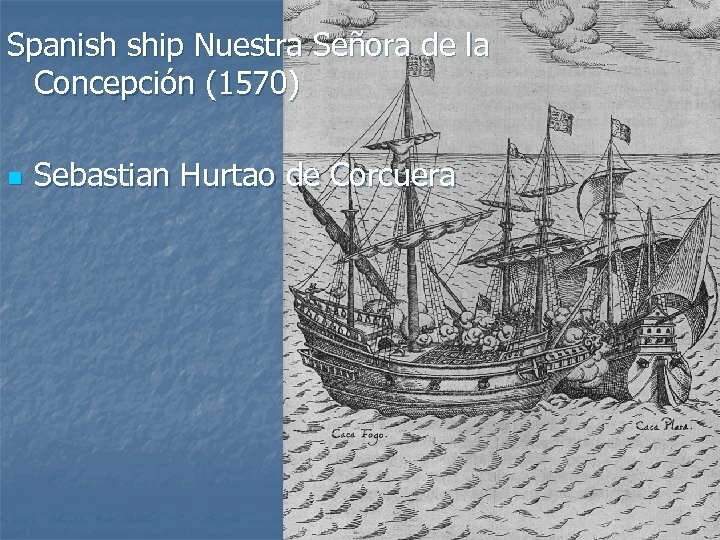 u According to the official records, in the first half of the seventeenth century, the Spanish galleons carried just short of three quarters of a million kilograms of silver to Manila. 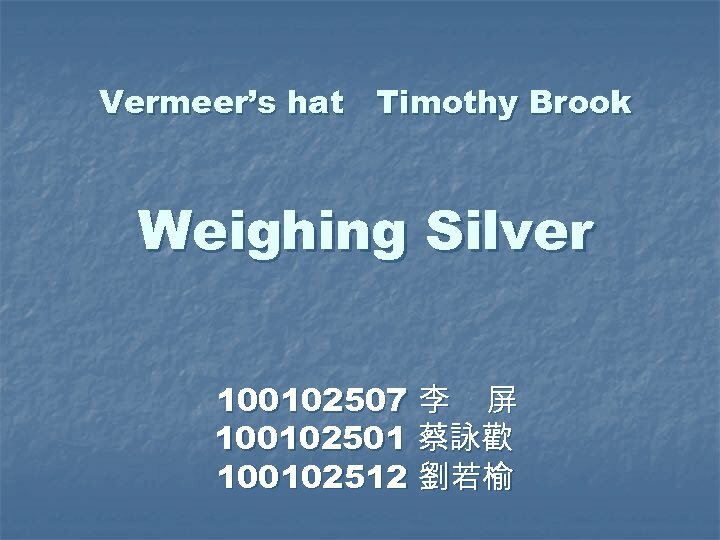 u NOT ALL this silver went to Fujian. Some got diverted to Macao and passed through Portuguese hands. But the most of it went to Fujian and disappeared into Chinese economy. 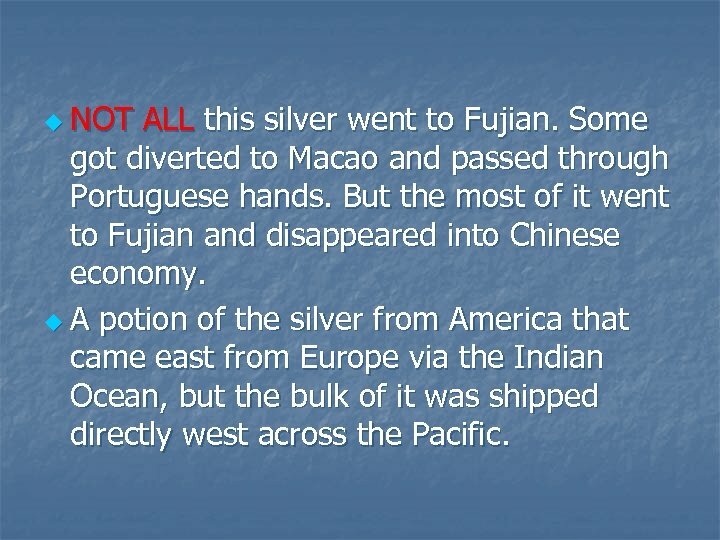 u A potion of the silver from America that came east from Europe via the Indian Ocean, but the bulk of it was shipped directly west across the Pacific. u. 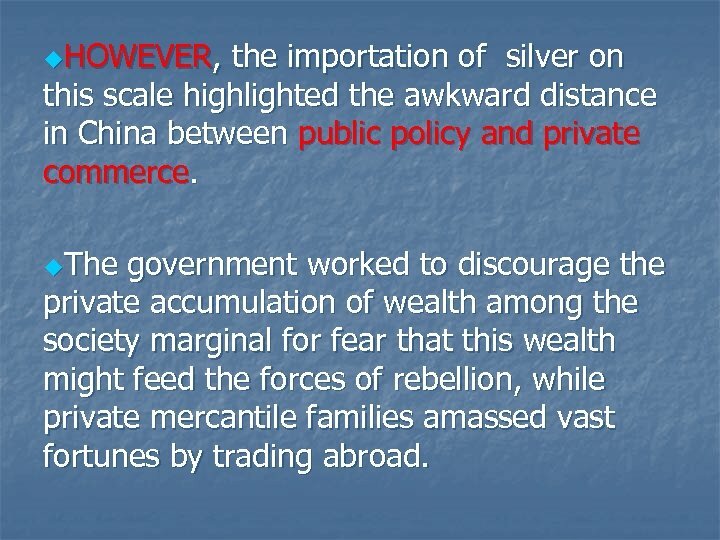 HOWEVER, the importation of silver on this scale highlighted the awkward distance in China between public policy and private commerce. 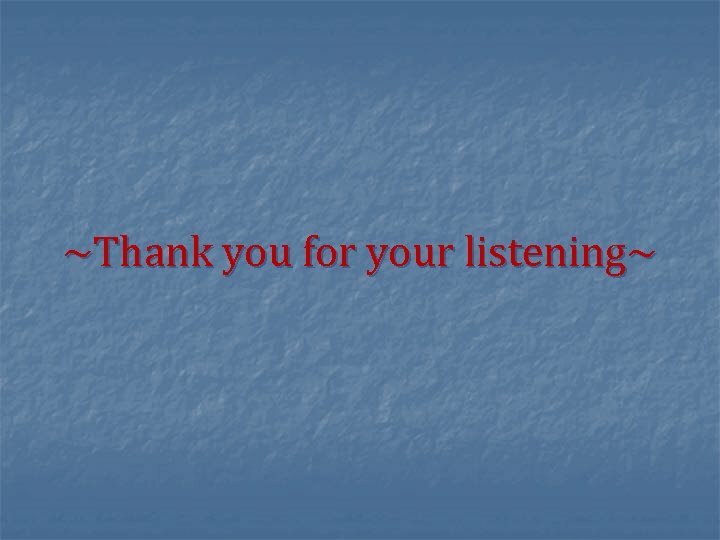 u. The government worked to discourage the private accumulation of wealth among the society marginal for fear that this wealth might feed the forces of rebellion, while private mercantile families amassed vast fortunes by trading abroad. 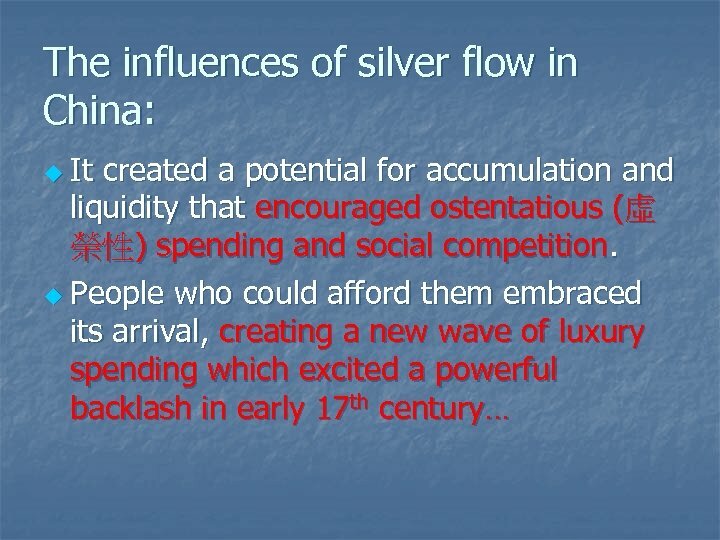 u Silver flowed easily into the Chinese economy because it was needed to supplement the small bronze coins that were used for small transactions. 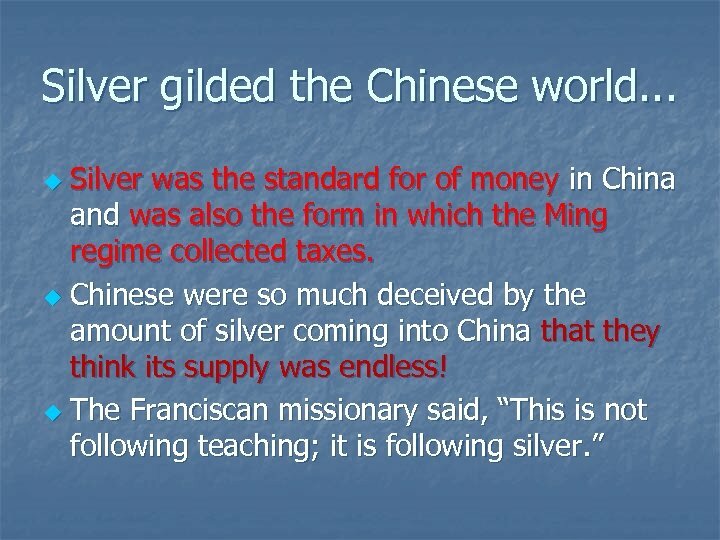 u The amount of silver coming to China was so great the Chinese believed its supply was endless. u However, the silver run out, or at least down, it would, as we shall see. 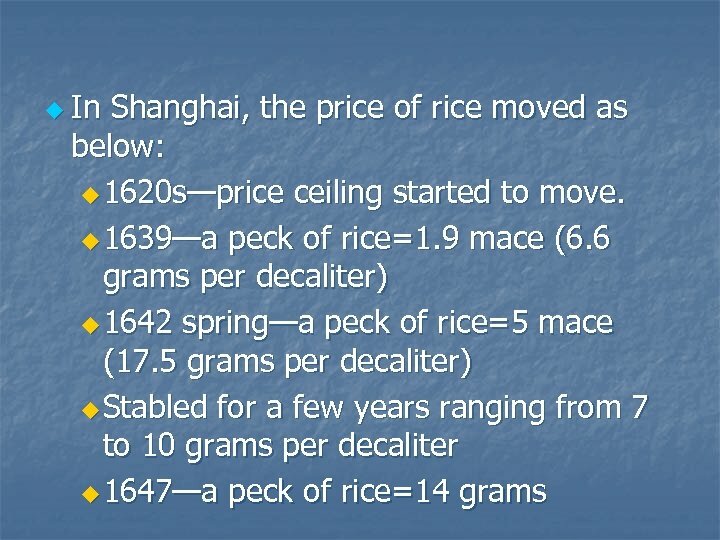 u The spring rains had washed away the local crop which in turn forced the price of rice to rise… normal times, per Chinese “peck”(dou) costs less than half a “mace”(qian). u In u 1 斗 = 不到半錢 (1. 875克的銀) u After spring rains, the price almost triple to 1. 3 qian (4. 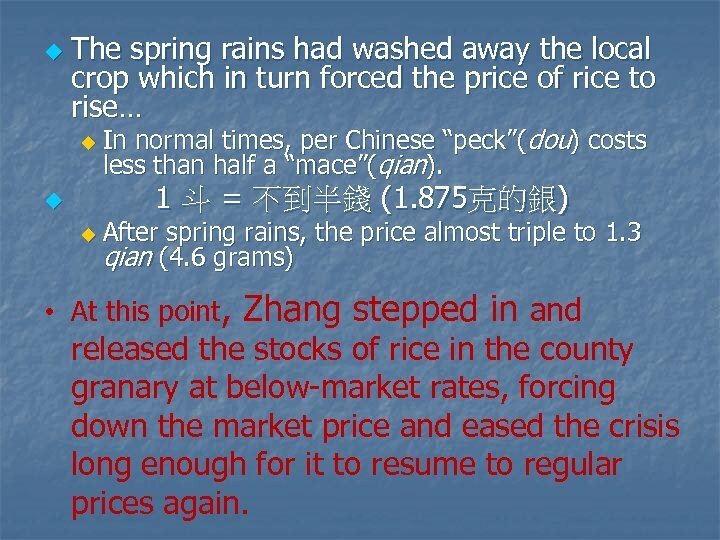 6 grams) • At this point, Zhang stepped in and released the stocks of rice in the county granary at below-market rates, forcing down the market price and eased the crisis long enough for it to resume to regular prices again. 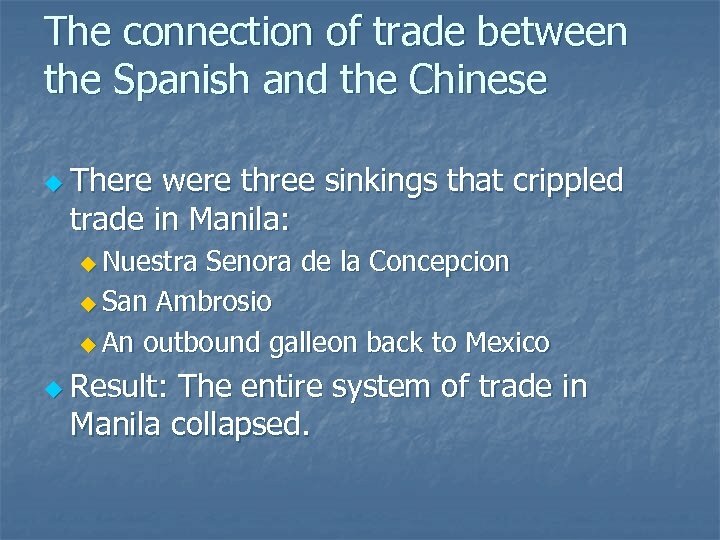 The connection of trade between the Spanish and the Chinese u There were three sinkings that crippled trade in Manila: u Nuestra Senora de la Concepcion u San Ambrosio u An outbound galleon back to Mexico u Result: The entire system of trade in Manila collapsed. 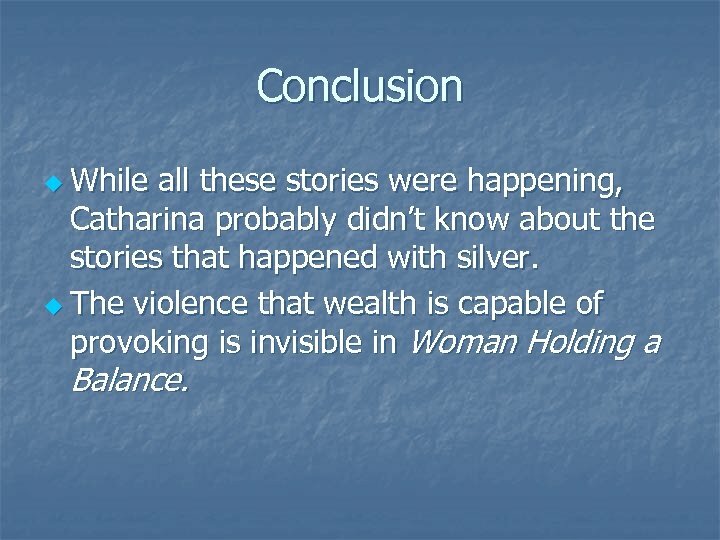 Conclusion u While all these stories were happening, Catharina probably didn’t know about the stories that happened with silver. 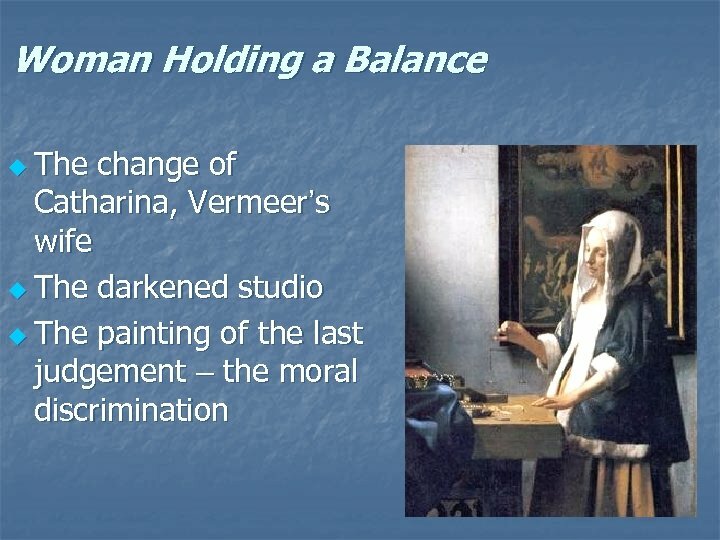 u The violence that wealth is capable of provoking is invisible in Woman Holding a Balance.